With only two weeks until the second edition of Desertfest Belgium kicks off in Antwerp, they have now announced the three very last bands to join the festival’s premium lineup, with Dutch stoner specialists THE MACHINE, Belgian doom supergroup BATHSHEBA and Dresden’s krautrockers WUCAN. Earth, Goatsnake, Orange Goblin, Bongzilla, Fatso Jetson, Dozer, Moon Duo, Ufomammut, Valient Thorr, Greenleaf, Belzebong, Stoned Jesus, Causa Sui, Siena Root, Monolord, Mars Red Sky, Glowsun, The Machine, Papir, Carlton Melton, Monomyth, Child, Harsh Toke, Planet Of Zeus, Deville, Pendejo, Vandal X, USA Out Of Vietnam, Banda De La Muerte, Tangled Horns, Psychonaut, The Progerians, Crystal Head, The Heavy Crown, Maudlin, Wucan, Bathsheba, Wheel Of Smoke, Sunder, Fever Dog, Black-Bone and 3rd Ear Experience. 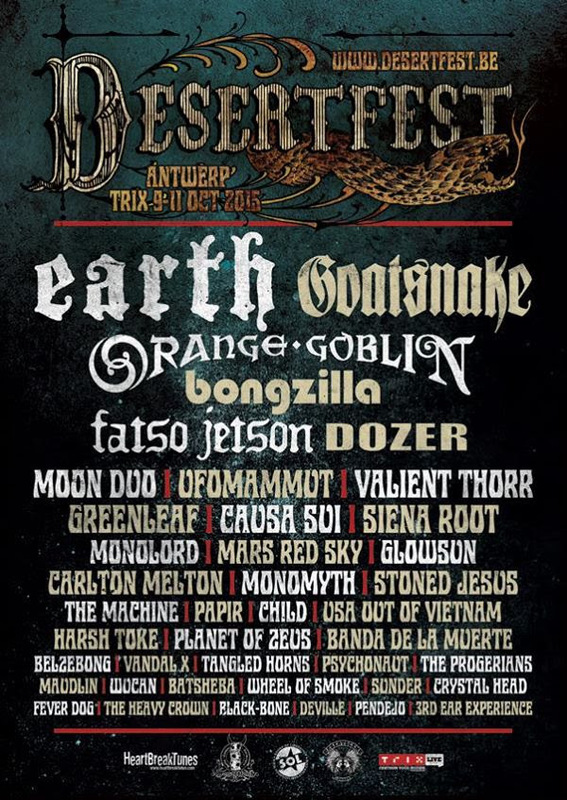 After a great first edition that saw the likes of Electric Wizard, Brant Bjork, Fu Manchu, Yob and dozens more tear down Antwerp, the DESERTFEST promoters decided to run their second Belgium edition this fall. Located in Antwerp outskirts, the Trix venue will once again host the world’s best heavy bands, spread over three stages drenched in that underground atmosphere we all love. Beware of the sandstorm!